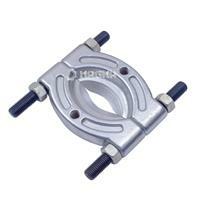 This Bearing Splitter separates and removes generator and fitting gears, single and double bearings and bearing cones and similar parts where ordinary puller jaws cannot reach. Knife like edges which are easily placed behind the part to secure a gripping surface even when clearences are extremely tight. Use with puller.